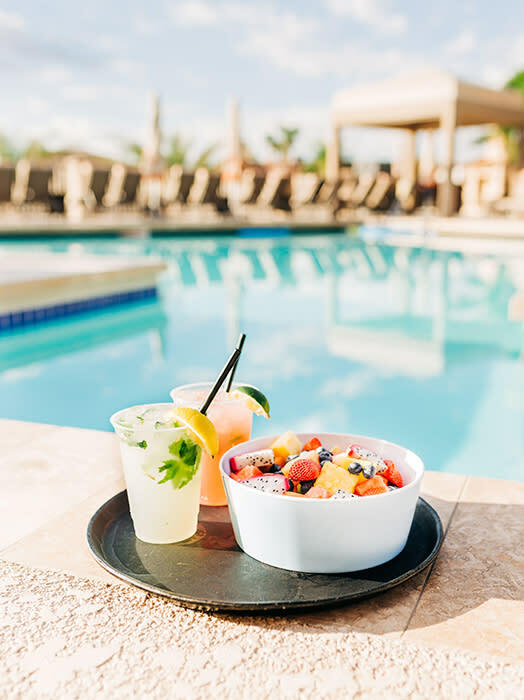 Planning your vacation at one of Scottsdale’s renowned resorts means world-class dining, award-winning golf courses, luxurious spas, panoramic vistas and tropical drinks by the pool. To raise your poolside lounging to the next level, take advantage of the cabana experience for luxe perks and unique amenities. Here are four of Scottsdale’s best and how you can expect to be pampered. The Fairmont Scottsdale Princess sits on 64 acres, which means six pools and cabana opportunities abound. My favorites are those found at Sunset Beach, where you can sink your toes into 9,000 square feet of soft white sand shipped from Florida. You’ll also appreciate iced tea and lemonade beverage dispensers, complimentary snacks, a refrigerator, TV, overhead misting fan, and restaurant service. Be sure to arrange for some fun pool floats! I found my giant inflatable margarita to be the perfect pool lounger while sipping cocktails. 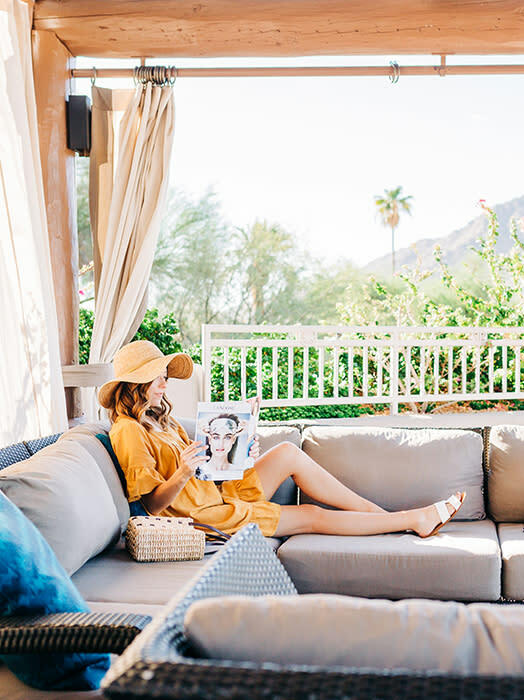 The JW Marriott Scottsdale Camelback Inn offers a variety of cabanas, but the most luxurious are the Jackrabbit Cabanas surrounded by Camelback Mountain views. These lofty latilla-style cabanas are tucked away by the Jacuzzi pool and include plush seating, scented towels, refrigerator, a flat-screen TV with sports package, and two appetizers from Hoppin’ Jacks menu (I’m a fan of the roasted veggie empanadas with ancho chile). Another tip: Ask for the special off-menu Cinnamon Piña Colada served in a fresh pineapple. 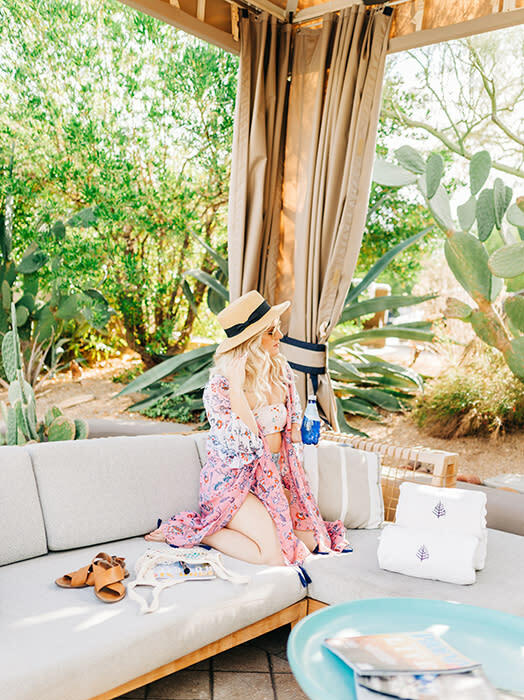 At the Four Seasons Resort Scottsdale at Troon North, reserve the Luxury Cabana at the adults-only pool on the lower level. You’ll enjoy an extra-spacious cabana with lounge seating, a 40-inch flat-screen TV and iPad, misters and ceiling fans. Relax on your reserved chaise lounges and enjoy amenities such as a refrigerator stocked with refreshments and chilled towels, afternoon snacks, board games and magazines, and Saguaro Blossom restaurant service – I suggest the Tuna Poke Bowl washed down with a refreshing Verde Margarita. The Phoenician’s recent $90 million renovation with a redesigned pool area and cabanas assures its place among my favorites. I especially like cabana number 12, which is just a few steps away from the adults-only pool for easy access. Your rental includes a flat-screen TV, minifridge, COOLA® Suncare kit, reserved poolside patio table and lounge chairs, and your choice of a tropical fruit bowl, bottle of Gruet, or chips and guacamole. Cool down with chilled towels and complimentary snacks, such as decadent chocolate-dipped frozen raspberry yogurt bars, and order Mediterranean inspired cuisine and mint lemonade from Kalio Kabobery.